A slow-moving storm system is producing widespread fog and low clouds on the east coast (and in the middle of the country as well). The water vapor animation above shows the cloud cover associated with the system. Water vapor imagery such as this suggests many different cloud layers, and in such cases the IFR Probability fields (below) rely on Rapid Refresh Data to provide information because Satellite signals of low clouds cannot occur in the presence of cirrus contamination. A simple Brightness Temperature Difference product would give little information about near-surface clouds over the Southeast. IFR Probability fields show a flat nature that occurs when satellite data cannot be used as a Predictor because of the presence of high clouds/multiple cloud layers. The Probability values are suppressed; interpretation of those values should be colored by the knowledge of the presence or absence of high clouds. In the example above, when high clouds briefly separate over central South Carolina around 0600 UTC, a region of higher IFR probability is shown. The algorithm is more confident that fog/low stratus exists because Satellite Predictors can also be used in that region. What changes is the ability of the GOES-R IFR Probability algorithm to assess the probability of IFR conditions because more predictors can be included; in the region where the high clouds part, satellite information about the low clouds can be included, and IFR Probabilities increase as a result. This entry was posted in Mid-Atlantic, Multiple Cloud Layers, Southeast on December 23, 2014 by Scott Lindstrom. IFR Probabilities give information about IFR Conditions that occur when terrain ascends up into the clouds, as happens sometimes in the Sierras. 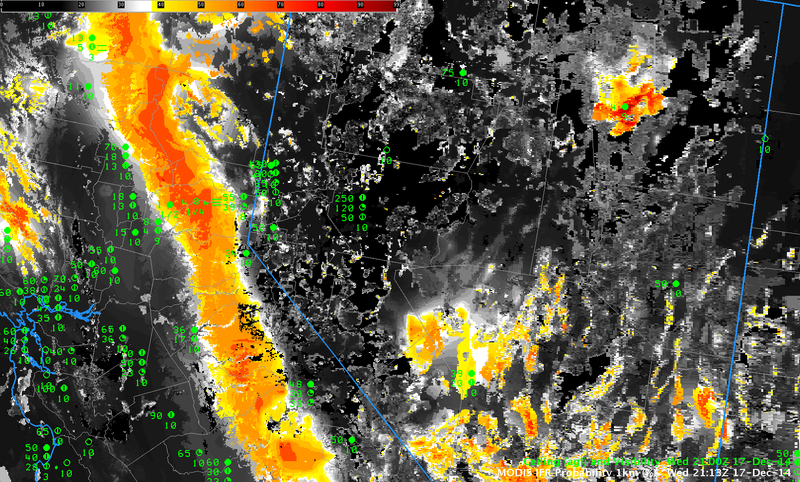 A stratus deck might exist over the Central Valley of California, but as that stratus extends to the east, the terrain rises up into the cloud, and IFR conditions result. The animation above shows IFR Probabilities during the night of 17-18 December 2014. Stations at elevation are not common, but Blue Canyon (KBLU) in Placer County is at 1600 meters above sea level. IFR Probabilities in/around north central Placer County (where KBLU is sited) are highest with the visibility is most restricted. Note in the animations that Truckee, CA, to the east of Blue Canyon, does not experience IFR Conditions, perhaps because it is east of the crest of the Sierras. MODIS data occasionally gives very high-resolution information. The data below from 2100 UTC on 17 December and shows the IFR Probability banked up against the Sierras. This entry was posted in California, MODIS, Terrain on December 18, 2014 by Scott Lindstrom.